The Federal Reserve raised interest rates by another 0.25% recently, and that’s a good thing for people saving in a savings account, because a hike in the “Fed Rate” usually results in an increase of the interest rate savings accounts pay. But still, another 0.25% is not going to raise interest rates to the magical levels they were back in the good ol’ days before the Global Financial Crisis of Doom. Back then, you could get 5% interest from online savings accounts! Except, here’s the crazy thing: I have a 5% savings account. FDIC-insured and everything. Wait—but how? The big national bank chains are paying tiny percentages on their savings accounts. For example, I just looked at Bank of America, and as of this writing they’re offering 0.06% on their savings accounts, and only then if you’ve got more than $2,500 in the account and you have to be one of their “Preferred Rewards Platinum Honors Tier” customers (aka have more than $100,000 in accounts with them—yikes!). And that’s just to get 0.06% on your savings. Not 6%, or even 0.6%, but 0.06%. Which is practically nothing, and is way less than inflation… meaning your money still loses buying power over time with that interest rate. So again… how the heck am I getting 5% when the big banks are offering a pittance compared to that? The answer is, surprisingly, prepaid debit cards. Yes, the kind that the “unbanked” population might use if there are no convenient bank locations or if they can’t get a checking account because of a bad history of overdrafting. These prepaid debit cards can be filled with fees, but many of them offer a “pay as you go” type plan that means you only pay a fee when you use the debit card like, well, a debit card. Are There a Lot of Hoops To Jump Through to Get 5% Interest? You have to have a transaction more often than once every 90 days on each debit card to avoid any “account inactivity fees.” Thankfully, you can just schedule an automatic monthly deposit of $1 from your regular bank account. I’ll walk you through this, but it’s really as easy as it sounds. 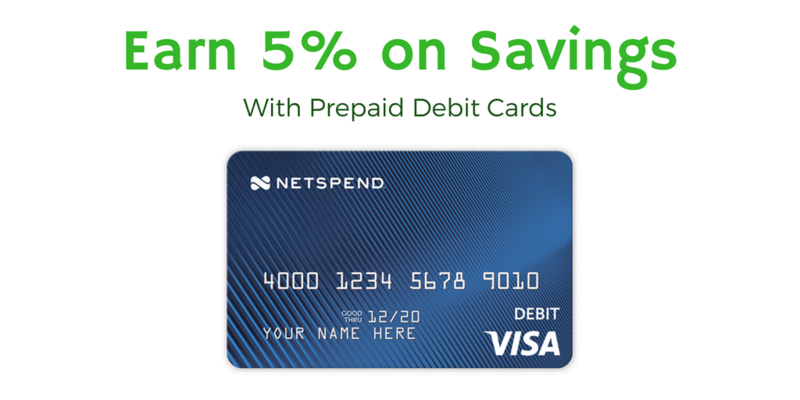 Each prepaid debit card has a limit on the amount they will pay 5% interest. For each NetSpend card, it’s on up to $1000. But there are 6 different varieties of the NetSpend card, so that’s up to $6,000 per person (or $12,000 for a couple). It’s the opening of additional cards that’s the “hoop,” but that’s also really easy (you can do it online). For people with short attention spans. Open up a NetSpend account with my refer-a-friend link and fund it with at least $40 within 30 days to get yourself a free $20 bonus. In your NetSpend account, open the savings account. It pays 5% on up to $1,000. 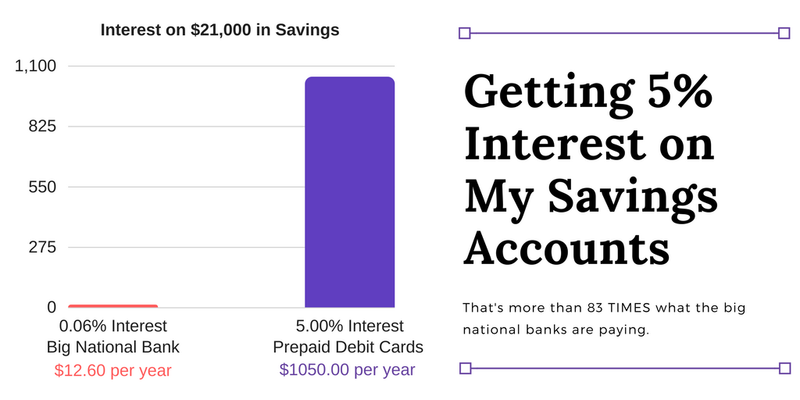 Once you have $1,000 in the NetSpend savings account, set yourself a calendar reminder at the beginning of every quarter (so like, Jan 1st, April 1st, July 1st, October 1st) to withdraw the interest, because the interest above $1,000 won’t be earning the 5%. Open up additional “branded” NetSpend cards. These don’t come with a bonus, but they will allow you to open up to 5 more places to earn 5% on $1,000. For each account that you open, you’ll want to set up at least 2 automatic recurring transactions per quarter to avoid the account inactivity fees. You need to set these up with your existing bank account and never set up a bank-to-bank transfer through NetSpend’s interface (because they charge fees for it, while your existing bank should not). Thus endeth the short version. For more details, keep reading! They offer a $20 bonus when you sign up using a refer-a-friend link (hey-o, like my refer-a-friend link! I also get $20 when you use this link, which is handy because that money helps keep this blog running). Their user interface is friendly, so it’s a good way to learn. They pay 5% on the first $1000 in the savings account, which is a decent amount but not crazy. So if you’re not a super-saver yet, best to go with NetSpend first and move on to other accounts once you’ve filled up that $1000. And if you’ve got more than $1000? It’s still a good place to start and see if this whole “prepaid debit card savings account” thing is right for you. An account (preferably a checking account, but a savings account will also work) with a bank that allows you to set up automatic transfers to accounts at other banks. I’ll refer to this account from here on out as your “Existing Account.” As in, the one that already exists when you start down this road. $40 in the existing account that you can transfer to NetSpend to get the $20 bonus. That’s it. It’s a 2-item list of things you need. This is going to be pretty easy! Why “preferably a checking account?” Because savings accounts have federal limits on how many times you can take money out of them each month (savings accounts are limited to 6 transfers out per month). Checking accounts have no such limits. This won’t be a big deal if you just set up 1 NetSpend account don’t take money out of your existing savings account for any other reason. But if you end up setting up 5 or 6 NetSpend accounts each for you and your spouse/partner plus other accounts, using just the one savings account, you’d start to run afoul of the transfer limits for savings accounts. So you can either use multiple savings accounts in that scenario… or a checking account. One additional caveat: Capital One 360 will not work as your “existing account” for NetSpend, because they refuse to let you connect your Capital One 360 account to NetSpend. You’ll need to use a bank other than Capital One 360 for the NetSpend account. It’s pretty easy: my NetSpend refer-a-friend link takes you right to the application page. Fill in the form and make sure that the “Referral Code” box is pre-filled with “8601849552” to qualify for the $20 bonus. Where it asks “Which of the following payments would you like to receive faster with Direct Deposit?” you can simply select “None at this time.” You can select whatever design for the card you like, but it doesn’t matter because you’re going to throw the card into a safe or the back of your underwear drawer. Time to hurry up and wait 7-10 days for the card to come in the mail. Bookmark this blog post and come back when your card arrives. Then, just transfer the $40 from your Existing Account to NetSpend, and you’ll have your $20 bonus! My bonus posted the very same day the $40 transfer hit my NetSpend account. Woohoo, $20! Got a spouse or partner? You can get another $40 in bonuses! Just send your referral link (find it in your NetSpend dashboard under “Features”>”Refer a Friend”) to your spouse/partner and have them follow the steps above. They’ll get the $20 bonus and you’ll get another $20 bonus—weehoo! But you’re not here just for that free bonus money. You want to earn 5% on the $60 that you now have in the account(s)… and on the $940 more that you’re going to put in there. So let’s continue on! Click the green “Enroll in Savings” button here and voilà! Your 5%-interest-bearing savings account is now open for business. As I said in the “hoops” section above, you’ll need to move money manually from the debit card part (NetSpend calls this your “Prepaid Account“) and the savings account part (NetSpend calls this your “Savings Account”). They will not let you deposit money directly into the savings account from your Existing Account. No biggie, though. Just transfer the money from your Existing Account (remember, always push or pull from the Existing Account to avoid fees!) to the debit card (“Prepaid Account”). Then come back to the NetSpend dashboard “Move Money” section and click “Savings Transfer” to move it and start earning 5% on it. Ah yes, the other hoop. Again, this is pretty easy, so don’t sweat it. In your “Existing Account,” set up an automated recurring transaction of $1 monthly from the Existing Account to the NetSpend card account. If you want to get fancy with it, you can set one up quarterly to push $1 to NetSpend and another one for 45 days later to pull that same $1 back out. As long as you have a transaction on the debit card (“Prepaid Account”) more often than once every 90 days, you’ll be golden. For that portion of the savings account that is $1,000.01, or more, the interest rate will be 0.49% with an annual percentage yield with an annual percentage yield [sic] of 0.50%. So, in other words, every penny in the savings account above $1,000 earns just 0.50% interest. That’s… not great. Especially not compared to the 5% interest the first $1,000 is earning. And not compared to other online savings accounts, either—you can easily find accounts paying twice that these days. I go in and take the interest paid on my NetSpend account out (transfer it back to the debit card part, the “Prepaid Account,” then have my Existing Account pull the interest amount back) every quarter, right after NetSpend pays it. I have a little calendar reminder on January 1st (and April 1st, July 1st, October 1st) to go in and do it. You might be thinking that all this “moving interest” business should count toward the transactions to help you avoid the inactivity fee. And yes, moving the interest from the “Savings Account” to the “Prepaid Account” seems to count as one transaction, and then pulling it from the Prepaid Account to your Existing Account is another one transaction. But since these two transactions have to be done manually, you might forget. Might as well automate and not count on those two transactions and just make sure all of your bases are covered by automated transactions. Where do I put the interest after I pull it out to my Existing Account? Why, it goes into the next account! Once you’ve got $1,000 in the NetSpend account, it’s time for you to open the next account. That’s it. That’s seriously it. That’s how I get a 5% interest rate, FDIC-insured. Just by opening accounts at the right places and setting up automatic transfers to avoid fees. 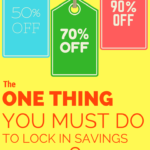 If you’re not getting 5% on your savings accounts, it’s time to set up your NetSpend account and get that FREE MONEY! Did any of this seem confusing? Not clear on something? Check out Financial Panther’s step-by-step guide to the NetSpend card. His guide is super duper thorough and really does take you step by step. I wrote my own guide above because I was sending the Financial Panther link to some people and they felt overwhelmed. I wanted to show that it’s really pretty simple with a simpler guide. But Financial Panther covers pretty much every scenario and “what if” so if you’re stuck or having trouble, that thorough guide can truly help. If you do use his guide, be sure to use his NetSpend referral link instead of mine, because goodness knows he should be paid for all the work he did! Hat tip to Jim Wang over at Wallet Hacks for first introducing me to the NetSpend card. Good note, Anna! I know that Capital One 360 won’t let you link up a Metabank (NetSpend) account anymore, but I had no idea they were giving trouble to people who already had them linked. I still have mine linked from before they changed the policy. But besides the automatic $1 transfers and moving the interest *into* my Cap 360 account, I don’t move any money between them. Thankfully Capital One 360 doesn’t seem to have any problem with Republic Bank of Chicago (what Insight Cards use). I think this is because Republic Bank of Chicago is a “real bank” that does a lot more than just prepaid cards, so it looks like any other bank to Capital One. Good thing too, since I just moved our entire tax refund into 2 Insight Card accounts last month! Weird! I hadn’t heard of that happening. Does it happen in different browsers? I know you have to activate the savings account once you have $10 in there, do you already have at least a $10 balance on the card? As of today, insight has ended the savings accounts. My husband and I have been looking for a better place to store our emergency fund. The Money Market Account that makes 0.3% interest is killing me, and this seems like it’d be a good alternative! It looks like Netspend has drops the interest rate to .49% on balances above $1000 now. Mango is offering 6% on $5000 (and 2% on up to $10000) but they have a $3/mo fee and you have to Direct Deposit $800/mo (net of any ACH withdrawls). I also found 5% on up to $1000 @ DCU. I’m thinking of moving my emergency fund to Mango as it looks like it will work out to around 5.4% after their fees, but I’ll need to jump through some hoops to move the excess funds out of the account every 2-12 weeks. I’m curious if you’ve found any other savings options over 5% that are easier and/or allow a higher balance? The interest rate on NetSpend balances above $1000 has been 0.49% for a while now, no change there. I looked at Mango but the direct deposit requirement and the difficulty of moving money out doesn’t make it a great solution for me. Curious if anyone has found any other cards or accounts paying over 4% interest without too many hoops? DB, thanks for this list. The Premiere Members CU is a great tip. MM account, no hoops to jump through. Easy place to park $2k. I used to have the five Netspend related accounts ( even before the reduction to $1K per account) but then this past spring two of the accounts got charged for NOT meeting the transaction requirements (even though they DID) and so I got rid of them. Not worth the hassle to me. I have been kicking around this idea. But when i look at my Dividend Portfolio and what im getting with alot less hassel .. I think i will stick with Dividends. BP is paying 5.663% and has been raising its dividend year over year. Everybody pays me quarterly with the exception of real estate that pays monthly. Since Im a buy and hold girl and in it for the longhaul, i dont care about stock price appreciation. Im in for dividends! Thru Robinhood i can buy a share at a time with no commissions. I wish you all well with your investment strategy. May we all prosper!